LOS ANGELES – The Southern California Pilipino American Student Alliance (SCPASA) aims to empower students of all backgrounds to become leaders and active, beneficial members of their communities. Since the organization’s revival in 2006, its overall mission is to establish a network of Pilipino intercollegiate coalitions from East to West, and to give students a personal, as well as professional space to talk about issues, be empowered and find their voice. In other words, the organization seeks not only to grow, but to revolutionize leaders. The Executize “Zeta” Board for the 2012-13 school year has been working extremely hard to get more students involved, serve the community, and create lasting relationships within the SCPASA family. Consisting of six students from six different college campuses, the Board represents the mission of SCPASA overall: one shared alliance within the larger SoCal community. “It’s a space that fosters the interconnectedness of our various organizations within Southern California,” commented Adrian Velasco, a fourth year biochemistry major at Cal State Fullerton, and the current Vice Chairperson for the Board. The SCPASA Board consists of hardworking, active students who are passionate about the organization and Filipino culture. The chairperson, vice chairperson, programming director, administrative director, financial director, and public relations director all work together to plan larger school-wide events such as Friendship Games at Cal State Fullerton, monthly “Collabs,” and their biggest annual conference event—SCPASA Summit. The board meets bi-monthly at a different location each time, with a check-in style agenda of programming, planning events, and of course, having fun. “We’re all very different people who didn’t know each other previously, and when we came together for one goal: for the love of the community,” said Financial Director Laarni Cordero, a senior accounting major at Loyola Marymount University. 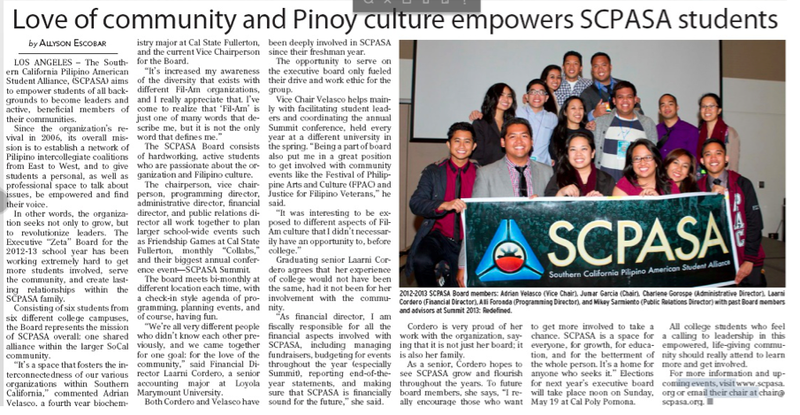 Both Cordero and Velasco have been deeply involved in SCPASA since their freshman year. The opportunity to serve on the executive board only fueled their drive and work ethic for the group. Vice Chair Velasco helps mainly with facilitating student leaders and coordinating the annual Summit conference, held every year at a different university in the spring. “Being a part of board also put me in a great position to get involved with community events like the Festival of Philippine Arts and Culture (FPAC) and Justice for Filipino Veterans,” he said. Graduating senior Laarni Cordero agrees that her experience of college would not have been the same, had it not been for her involvement with the community. “As financial director, I am fiscally responsible for all the financial aspects involved with SCPASA, including managing fundraisers, budgeting for events throughout the year (especially Summit), reporting end-of-the-year statements, and making sure that SCPASA is financially sound for the future,” she said. Cordero is very proud of her work with the organization, saying that it is not just her board; it is also her family. Elections for next year’s executive board will take place noon on Sunday, May 19, at Cal Poly Pomona. All college students who feel a calling to leadership in this empowered, life-giving community should really attend to learn more and get involved. For more information and upcoming events, visit www.scpasa.org or email their chair at chair@scpasa.org.